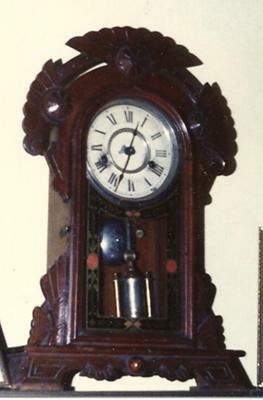 The dimensions of the clock are: 18-1/2" high x 11-3/4" wide x 4-1/4" deep. - curved top with 3 flowers (8 petals ea) one at top, one on each end of curve. Top flower has 9 "rays" emanating from it; the other 2 flowers each have 8 rays emanating from them. - "ball" is a silver-colored tube-like structure with 2 smaller gold-colored tubes on each side. There is a small striated gold-colored ball at the top of ball. Ball is 4-1/4" tall. if too fast, raise it.